The land of the free and the home of the brave? The True North strong and free? 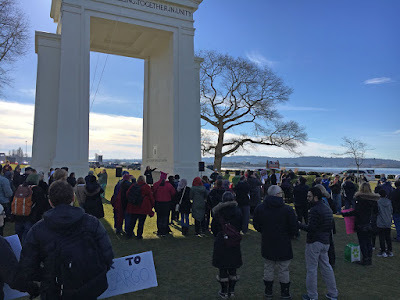 Hundreds gathered at the Peace Arch Border Crossing Sunday afternoon, January 12, 2017 to express concern and opposition for recent American immigration policies and attitudes impacting immigrants and refugees. This peaceful demonstration had originally been planned for January 5th but had to be postponed due to poor weather conditions. Like every single person who has ever lived, I had no choice in which country I'd be born in; Nor into which religious tradition. I did not get to choose my parents, I had no choice over my mother tongue. I had no choice when it came to the color of my skin. I did not choose my sexual orientation And I did not choose to be transgender.